Ever see a holiday trending on social media and think, “Why didn’t I know about this? It fits perfectly with our brand messaging!” Well, we’re here to help. 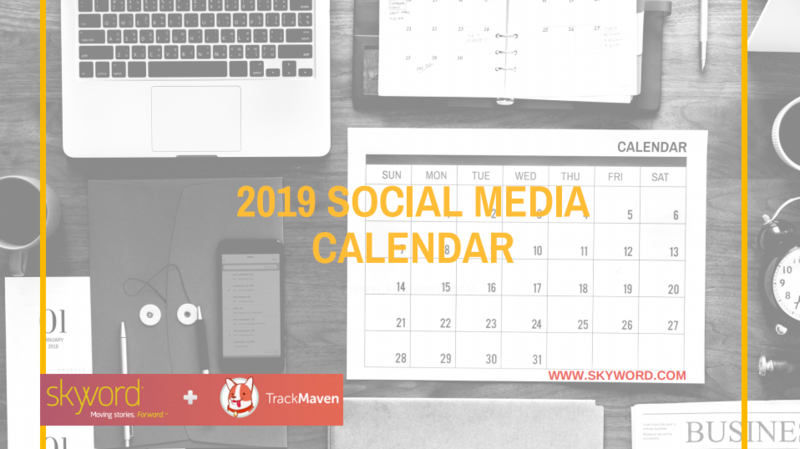 We created a downloadable social media calendar for all of 2019 to make sure you never miss #NationalDogDay again. Whether you’re planning a social media campaign, adjusting your blog content, or teaming up with an influencer, marketers should tap into holidays and national days for increased awareness and an enhanced strategy. However, the trick is knowing about these days far enough in advance to properly plan and execute, instead of waiting on last-minute approvals or until the holiday rolls around again next year. Looking to go a step further and create content marketing at scale? Talk to us, and see how we can create and measure high-quality, original stories across various channels to help elevate your brand and delight your customers. Fill out the form below to receive your calendar via email. © 2019 Skyword. All rights reserved.